The technology industry is still young, but its history is already rich with myths and legends. The biggest myth is about how invention actually occurs – the notion of that “aha”’ singular, magical moment leading to inevitable success. The reality, as Malcolm Gladwell made clear in his New Yorker Creation Myth article several years ago, is that invention is more ponderous, with one idea building on another. Within the technology industry, this cycle of invention is captured in eras, from mainframe and mini, to PC, Internet, mobile and the cloud. Most within the industry move from wave to wave, hoping to catch each successive one at just the right time. Cutler, a Microsoft Senior Technical Fellow whose impressive body of work spans five decades and two coasts, will be honored Saturday evening as a Computer History Museum Fellow, along with Lee Felsenstein, the designer of the Osborne 1, the first mass-produced portable computer; and Philip Moorby, one of the inventors of the Verilog hardware description language. They join other wave makers such as Alan Kay, Vinton Cerf and Tim Berners-Lee in the museum’s Hall of Fellows. Cutler, 74, who still comes to his office each day on Microsoft’s sprawling Redmond, Washington, campus, has shaped entire eras: from his work developing the VMS operating system for Digital Equipment Corporation in the late ‘70s, his central role in the development of Windows NT – the basis for all major versions of Windows since 1993 – to his more recent experiences in developing the Microsoft Azure cloud operating system and the hypervisor for Xbox One that allows the console to be more than just for gaming. “There wouldn’t be a Microsoft today without Dave,” says former Microsoft CEO Steve Ballmer. Ray Ozzie, Microsoft’s former chief software architect, first met Cutler in the late ‘70s when he was a software engineer at Data General, a Digital Equipment Corporation (DEC) competitor. He considers Cutler one of the industry’s most preeminent and prolific engineers. “If there’s one technical person who’s indispensable in the history of modern Windows, it’s Dave,” said Terry Myerson, executive vice president, Windows and Devices Group. Cutler is a doer, not a talker. One of his favorite idioms is: “When all is said and done, much more is said than done.” So perhaps it’s best to have others put into perspective the impact he’s had on the computing experiences of billions of individuals and hundreds of thousands of businesses worldwide. In 1976, DEC was the darling of the technology industry. It and other competitors, like Data General and Prime Computer along the Massachusetts Route 128 corridor, ruled the computing landscape. Gordon Bell, a Microsoft consultant now, is known for, among other things, Bell’s Law. But Gordon Bell, the company’s top engineering executive, was concerned. Sales of the company’s flagship product, its 16-bit PDP-11, were stagnating and rival IBM was on the verge of releasing its first minicomputer. Bell’s response: Change the playing field by introducing a new, 32-bit super-minicomputer line of systems called the VAX with a new operating system that would be backward compatible with the company’s PDP-11 programs. Bell asked a 33-year-old engineer, who had joined the company four years earlier and made a name for himself by developing real-time operating systems for the PDP-11, to lead development of the VMS operating system. Forty-one years ago this month, Cutler and four other senior engineers launched the VMS project; Cutler was the senior programmer. The VAX/VMS V1 development team outside “The Mill” in Maynard, Massachusetts. Burton Smith is perhaps the best-known parallel computing designer and a Microsoft Technical Fellow. In the late ‘70s, he was working for a high-performance computing company and had the opportunity to meet Richard MacNeal, a founder of MacNeal-Schwendler Corporation, now MCS Software, the company that developed NASTRAN, a finite element analysis program. In 1982, Cutler met with Bell and announced he intended to leave DEC to form a company with a scientist from Lawrence Livermore National Laboratory. After meeting with Cutler and his cofounder, Bell made a counter offer, knowing how frustrated Cutler had become with the growing bureaucracy at the company’s headquarters at a former wool mill in Maynard, Massachusetts. Bell told him, “Go anywhere you want to go, take anyone with you that you want, and do anything you want to do.” DECWest was born. In 1988, Cutler left DEC when his team’s Prism project, with its new Mica operating system, was killed. Bell had first introduced Cutler to Bill Gates in 1983. Now, five years later, Cutler would join Microsoft to develop a new portable operating system, and create a new wave. Rob Short had worked for DECWest since 1982. After DEC cancelled the Prism project, Cutler, two more business-oriented colleagues and he thought they might start a new company. “But then Dave got a call from Bill Gates,” Short said. “That kind of freaked us out because we didn’t really have a high opinion of Microsoft at that point.” That meeting led to a follow-up meeting with Gates, Ballmer and Myhrvold. Later that month, on Oct. 31, 1988, Cutler started at Microsoft. Short and other members of the DEC West team (five with software expertise, six with hardware) would soon follow. They provided their notices to DEC on a Friday and started the following Monday, recalled Darryl Havens, who would write the input-output system for NT. The small, high-powered team of former DEC engineers and one existing Microsoft employee (Steve Wood) began by spending six months creating a specification for the operating system ­­– the specification that now resides in the Smithsonian Institute. The team started coding in earnest in April 1989, working double-digit hours six or seven days a week. The main goal: produce a portable operating system that could run on architectures other than Intel’s x86 chips and take advantage of the increased address space offered by nascent 32-bit microprocessors. RISC architectures were popular at the time and promised better performance than the x86. IBM and Microsoft had been cooperating on an operating system called OS/2, but it was a 16-bit operating system that ran only on Intel hardware and wasn’t portable. One of the toughest challenges was testing the system. Early on, the team decided it didn’t have the resources necessary to write a comprehensive test suite. Instead, they opted for a dynamic stress system, which put a severe load on the overall system. Every night the team ran stress tests on hundreds of machines. The next morning the team would arrive at the office, triage the failures and identify the bugs for the daily 9 a.m. bug-review meeting. The playing field kept shifting as well. At first, the team was going to target the expanded OS/2 32-bit API as the main “personality” of the system, but later they changed to Windows 32 when Windows 3.1 proved to be so popular (16 million copies sold in six months). As a result, the team had to expand the Windows 16 API to a Windows 32 API and redesign the entire graphics subsystem. The team also had to hit the reset button on hardware when it changed its initial hardware target from the Intel i860 XR RISC processor to the MIPS R3000. Another particularly vexing problem was getting DOS and Windows 16 applications to run in the new 32-bit environment. 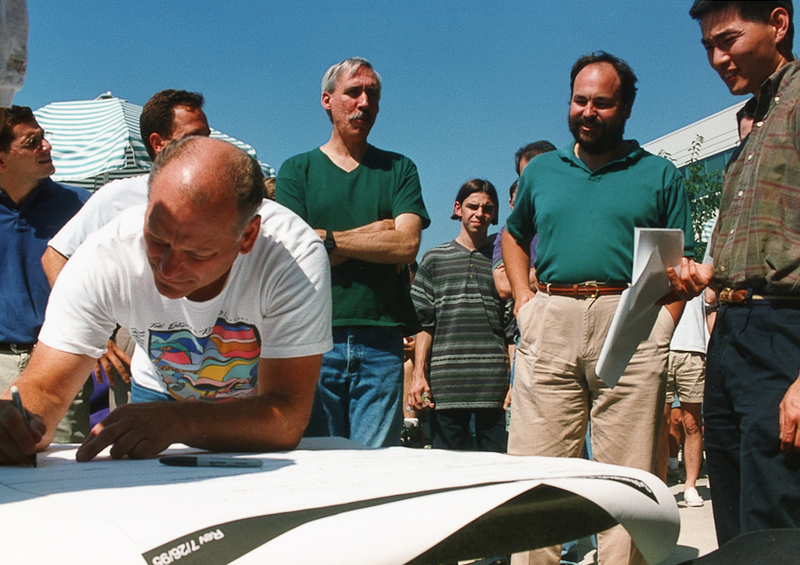 Dave Cutler signs autographs at a Windows NT ship party. “What Dave and team accomplished was an almost impossible design challenge,” said Ed Lazowska, the Bill & Melinda Gates Chair in Computer Science & Engineering at the University of Washington. In 1988, when the project first began, the team comprised about 20 engineers. By the time the first version of Windows NT shipped five years later, the team had expanded to about 150 engineers as it battled constraints and tradeoffs. Windows NT 3.1 shipped on July 27, 1993. The team was exhausted, but exhilarated. Cutler stopped managing the entire NT project in 1996, but continued to lead the kernel development until 2006. In March 2005, he completed one of his “most gratifying pieces of work” at Microsoft when, partnering with AMD, he helped develop the AMD64 architecture (64-bit extensions to the 32-bit x86 architecture) and led the effort to ship the first two x64 64-bit Windows systems (workstation and server). At the time, some questioned why Microsoft developed a 64-bit system; today most computers are 64-bit systems and even our phones will soon have a 64-bit operating system. Amitabh Srivastava on stage at PDC 2008, wearing the “Project Red Dog” sneakers that Cutler designed. In 2006, Amitabh Srivastava was a corporate vice president in Microsoft’s Windows division, working on redefining the organization’s engineering processes. Ozzie had recently been named the company’s chief software architect and the two had their first meeting one late afternoon in Building 34 on Microsoft’s campus. Srivastava has always had a rule: If he’s in town, he never misses dinner at home with his family – or if he needs to, he tells his family he’ll be late. That evening, Srivastava lost track of time. He missed dinner and never called home to say he’d be late. The one-hour meeting began at 4 p.m. and went until 8 p.m.
“By the end of that meeting, I was convinced software wouldn’t be shipped as it had been. My personal realization was, ‘I’m working on the wrong thing,’” Srivastava recalled. After a few more weeks of discussions, Srivastava knew Microsoft needed to build an operating system for the cloud, and he identified his first task: Recruit Cutler. The due diligence process took a few months as Cutler and Srivastava listened to the pain points and band-aid approaches teams had taken to keep their cloud services running. After the tour, Cutler and Srivastava never had a formal discussion about him joining the team. Cutler was on board. At PDC 2008, Ray Ozzie announced a technology preview of Windows Azure (now Microsoft Azure). Two years later, on Oct. 27, 2008, Ozzie stood on stage at the company’s Professional Developer’s Conference in Los Angeles and announced a technology preview of Windows Azure (now Microsoft Azure). Boyd Multerer, then-director of development for Xbox One in 2011, worked with Cutler to develop a virtual machine for Xbox One. In 2011, Boyd Multerer, the then-director of development for Xbox One, had a problem. Multerer, who helped create Xbox Live, the gaming and entertainment service, and the father of the popular XNA video game programming language, had decided with his team that Xbox One needed a virtual machine if both games and apps were going to run on the console. The initial thinking was that it might be too hard to work. Hoi Vo, a distinguished engineer on Multerer’s development team, knew Cutler, having worked with him on Microsoft Azure. He helped broker a meeting for Multerer, Cutler and himself in a “neutral” building on Microsoft’s campus, away from both the Xbox and Azure teams. A couple days later, Cutler communicated to Multerer and Vo that he wanted to learn more. Soon they set up a second meeting with the team’s distinguished and senior engineers. The team was “scared to death,” Multerer recalls. In the meeting, each engineer explained what she or he was doing, talking about the importance of performance, predictability and robustness. Soon after, and a few months before his 70th birthday, Cutler joined the team. He soon “set the bar for how hard people should work and how high they should hold the quality bar,” Multerer said. 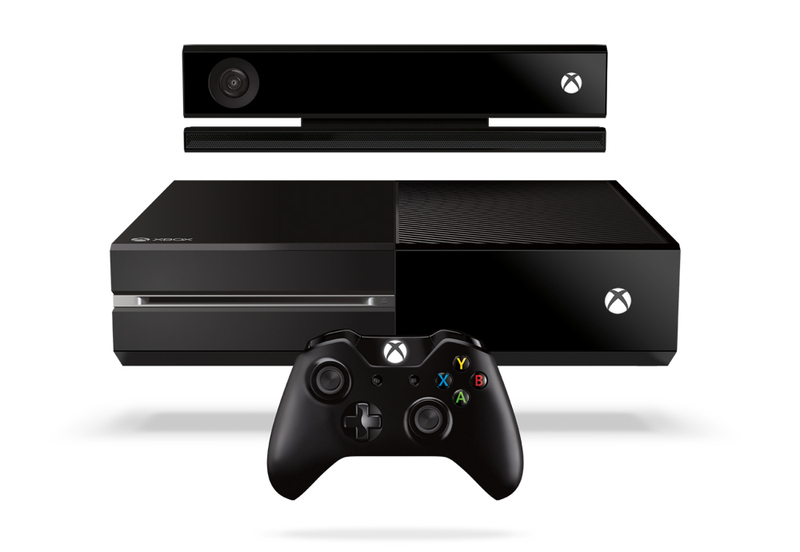 Two years later, on Nov. 22, 2013, Xbox One shipped in North America. Months before his 70th birthday, Cutler joined the Xbox One team. Having the opportunity to see Cutler work as an individual contributor, collaborating closely with a small number of other engineers on his team, Multerer got an opportunity to see what separates the best from the rest. Valerie Chen is an 18-year-old high school senior at Thomas Jefferson High School for Science and Technology in Alexandria, Virginia. On a recent Saturday in March, she and three other high school seniors were in Seattle, being honored at the Living Computer Museum. Chen, Matthew Edwards from Blacksburg High School in Blacksburg, Virginia, Karthik Rao from Briarcliff High School in Briarcliff Manor, New York, and Cherry Zou from Poolesville High School in Poolesville, Maryland, became the first recipients of the Association for Computing Machinery (ACM) and Computer Science Teachers Association (CSTA) Cutler-Bell Prize in high school computing, funded by a $1 million endowment established by Cutler and Bell. Each winner received a $10,000 prize. The four students presented their projects to Bell, Cutler and Jeannette Wing, a Microsoft corporate vice president of research, among others from ACM and CSTA. Valerie Chen, an 18-year-old high school senior, was one of four students honored at the Living Computer Museum recently. Here she is pictured with Gordon Bell (left) and Dave Cutler. In return, the students provided Cutler and Bell some advice on how they could better use social media to publicize the prize among high school students. There certainly are more computing waves to come; Bell and Cutler want to ensure that the next generation of engineers is prepared to make and ride the waves. The Cutler-Bell award might encourage future generations of engineers to pursue opportunities in augmented reality or quantum computing, but Cutler already has impacted generations of engineers, Ozzie insists. “One of Dave’s unspoken contributions is that he has created generations of incredibly strong engineers, simply as a side-effect of being who he is and doing what he does,” Ozzie said. “Speaking from personal experience from back in the ‘70s and ‘80s, those who worked for him – such as Tim Halvorsen and Len Kawell, my cofounders in the startup that created Lotus Notes – were taught a very specific engineering rigor. They learned about coding and commenting conventions, source code and project organization conventions, and so much more. There was only one way to do things ‘right’ and ‘optimally,’ and it was intensely rigorous. He taught them. They taught me. I taught others. Generations have learned rigorous methodology, and have become far better engineers, even without having directly worked with him. Cutler intends to do just that. On Monday morning, he’ll be back at his Studio A office at Microsoft, because he’s a thinker doer, not a talker. His advice for Valerie, Cherry, Matthew, Karthik and forthcoming generations of software engineers? “I’m a great believer in Fred Brooks’s taxonomy of people,” Cutler said. “He said in his book, “The Mythical Man Month,” that there are thinkers, doers and thinker doers. Thinkers are a dime a dozen. Anyone can think and profess great ideas. Doers are more valuable because they do things and get things done. The most valuable, however, are the thinker doers. They think and they do! “Much of my success belongs to the people I have worked with,” Cutler added. “Every project I have worked on has been filled with industry-leading software and hardware engineers. My part in relation to theirs has been quite small. “But I have always strived to be a thinker doer,” Cutler continued. “I have a couple of sayings that are pertinent. The first is: ‘Successful people do what unsuccessful people won’t.’ The second is: ‘If you don’t put them [bugs] in, you don’t have to take them out.’ I am a person that wants to do the work. I don’t want to just think about it and let someone else do it. When presented with a programming problem, I formulate an appropriate solution and then proceed to write the code. While writing the code, I continually mentally execute the code in my head in an attempt to flush out any bugs. I am a great believer in incremental implementation, where a piece of the solution is done, verified to work properly, and then move on to the next piece. In my case, this leads to faster implementation with fewer bugs. Quality is my No. 1 constraint – always. I don’t want to produce any code that has bugs – none. Words to live by from a man who, when all is said and done, has done more than he’s said. Watch a short summary of Dave Cutler’s contributions to computing. This video will be shown on Saturday at the Computer History Museum Fellow Awards Gala just before Cutler is inducted to the Hall of Fellows. ©2016 Computer History Museum. Visit computerhistory.org to learn more about the Computer History Museum Fellow Awards.